Sometimes it's best not to have a plan or to have a plan that goes awry and then improvise your way through the day. You never know what you might discover when you leave things up to chance, even when wandering around familiar territory. This was the case today. My husband and I planned to go try out a new "gourmet burger" joint and then catch the latest Wes Anderson creation, The Grand Budapest Hotel. The first part of our plan was accomplished, but the second plan fell through due to the movie selling out. Instead of going home, we wandered around a quaint little town and discovered all sorts of random things. 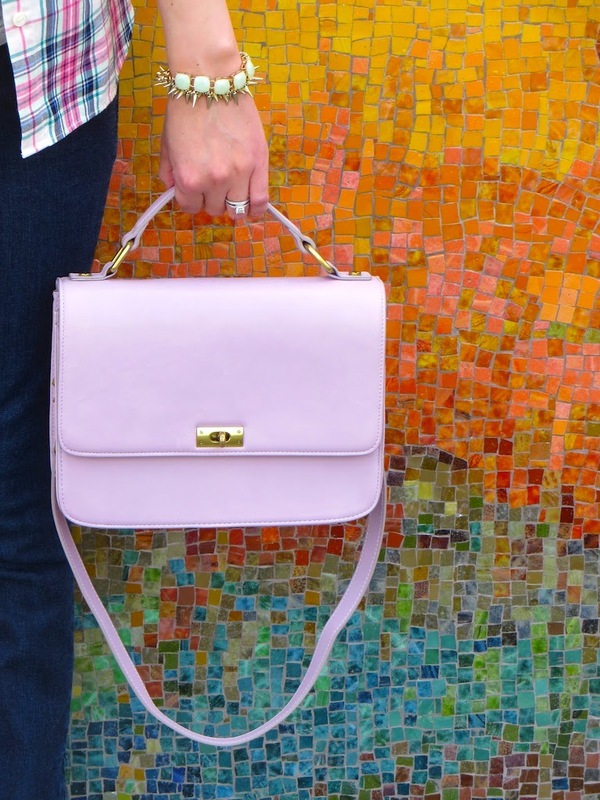 One such random discovery was this mosaic backdrop that is great for taking blog photos. 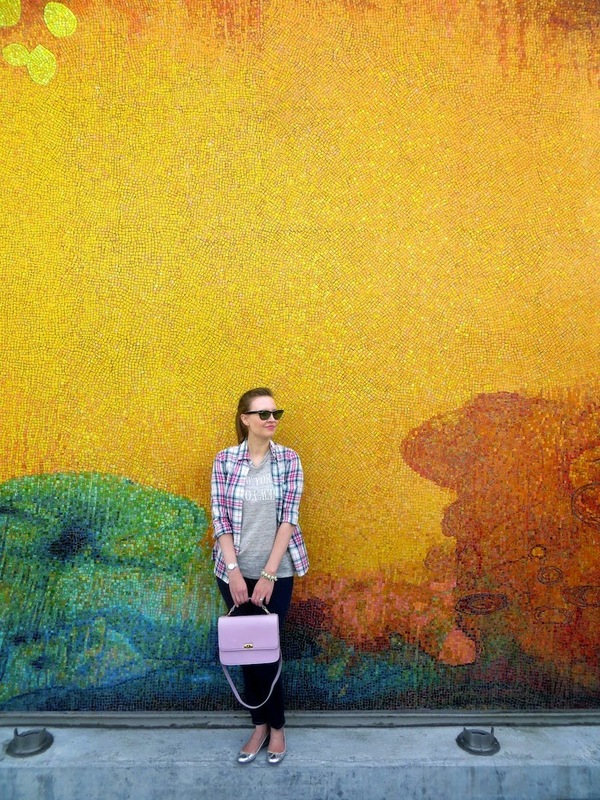 I feel like I am standing in front of some sort of vast, dreamy impressionist masterpiece! I wish I had something a bit more fashion forward on than a flannel shirt and jeans, but I tried to rock the look as much as possible. The burger place we went to is called Round's Burgers, a small chain in the L.A. area. It was okay considering the price. Regardless, the burgers sure look hot and juicy in the picture! The chilli cheese fries were very good though, but how can chilli cheese go wrong? I am not looking forward to reading a book entitled, Fast Food Nation this summer. (I have to read it because my school is introducing non-fiction into the curriculum.) I love fast food, especially burgers, so as you can imagine knowing the grizzly details of the industry isn't very appealing to me! After eating our burgers and feeling a bit full from them and the fries, we ventured to the movie theater. When we discovered it was a no go, we wandered around and visited a farmers market, a toy store and some other local shops. Below you will see some of my random discoveries which I happened to snap with my camera. The above store and its sign was my favorite random discovery of the day. Apparently this is a new art and framing store that opened up in the town. 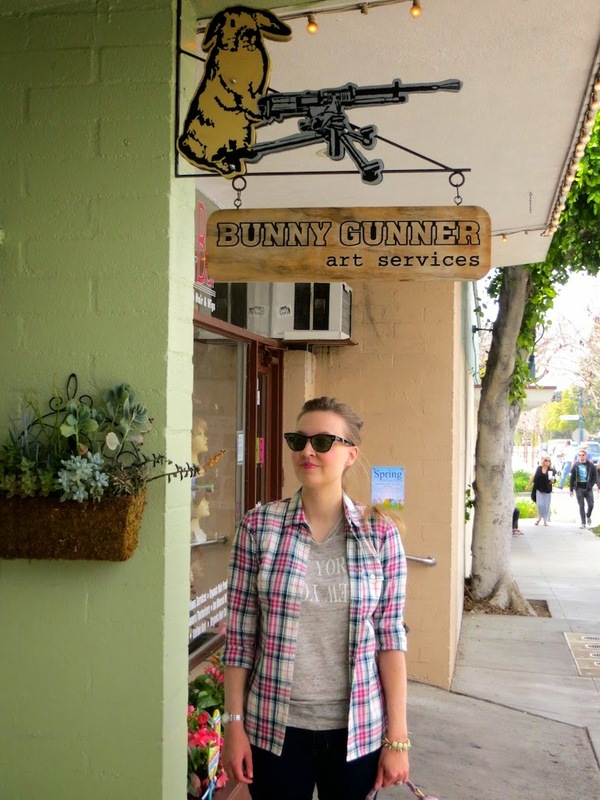 Its sign features a cute lop eared bunny using a machine gun that is banned here in California. This bunny means business! I think it is one of the best graphic designs ever! 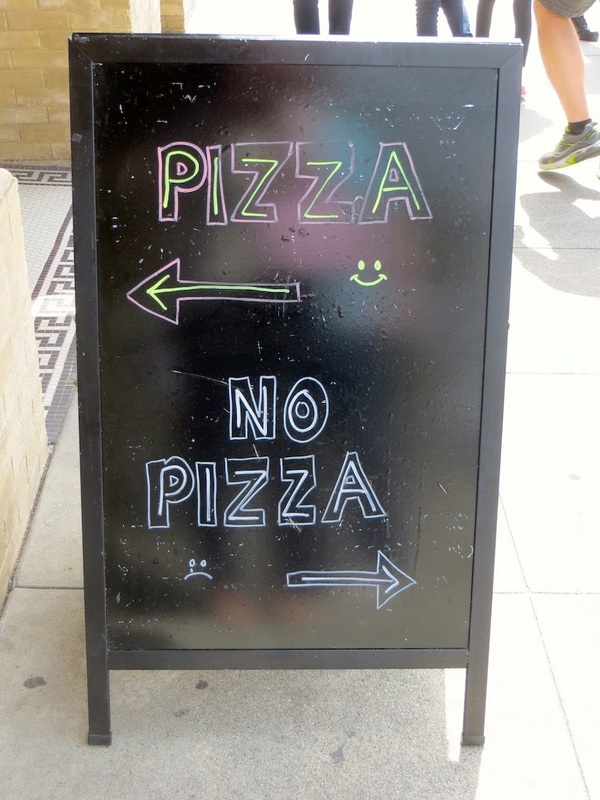 I guess the owners of this local pizza store thought that this sign was a good marketing strategy, suggesting that if you go in where the pizza is you will feel happy, but if you steer away you will ultimately end up sad and depressed. Below you will find my last random discovery which is the beautiful cherry blossoms that are starting to appear in full force. 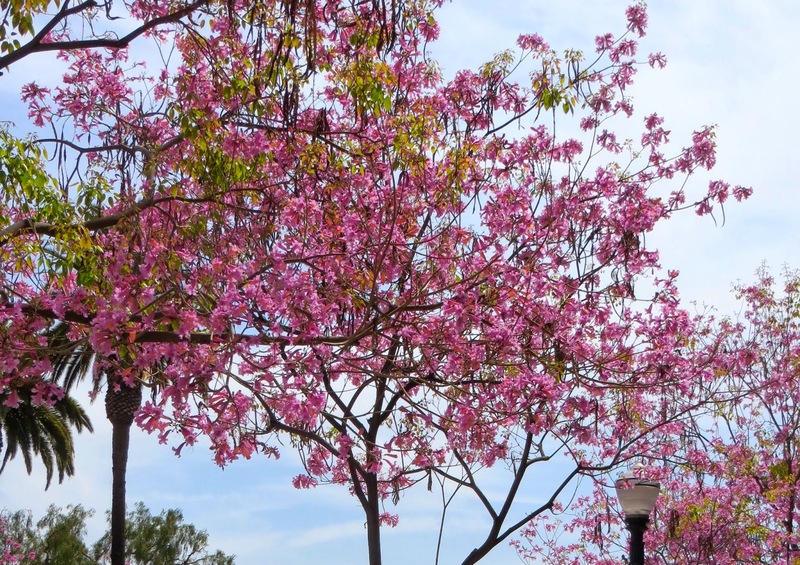 I just love cherry blossom trees with their pinkish leaves dropping everywhere. 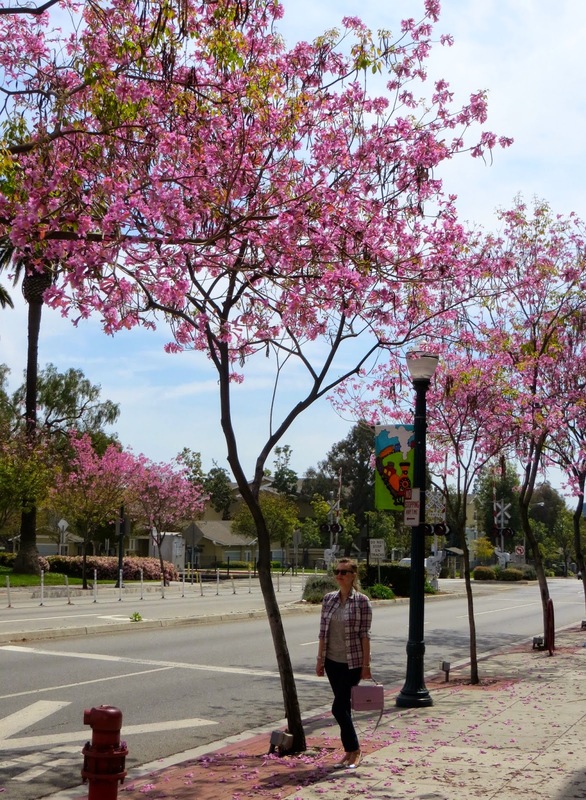 It certainly makes all of the streets and the sidewalks a little bit more festive and beautiful! I hope you all had a wonderful weekend too! What random discoveries did you happen upon? That pizza/ no pizza sign is hilarious!!! I love the bunny sign! Our blossoms are blooming here too - one day when we own we want a tree. :) Love the plaid! 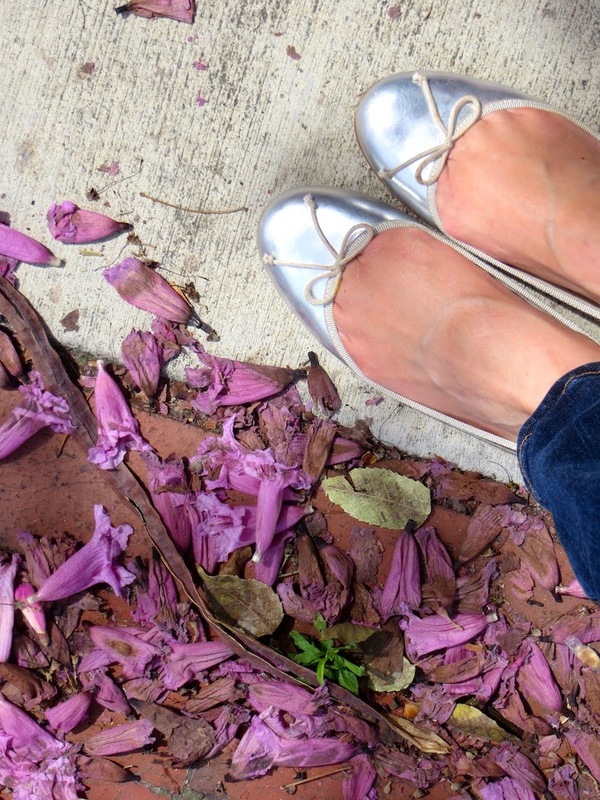 Love, love your Jcrew Edie bag!